Direct thermal, 203 dpi, 4.2" print width, Serial, Parallel, and Ethernet interfaces, 2MB DRAM, 4MB flash. Includes US power supply and product reference guide. Order cables separately. Direct thermal, 203 dpi, 4.2" print width, Serial and Parallel interfaces, 2MB DRAM, 4MB flash. Includes US power supply and product reference guide. Order cables separately. Direct thermal, 203 dpi, 2.4" print width, Parallel interface, 2MB DRAM, 4MB flash. Includes US power supply and product reference guide. Order cables separately. Thermal transfer, 203 dpi, 2" print width, Serial, Ethernet, 2MB DRAM, 4MB Flash, Includes US power supply. Thermal transfer, 203 dpi, 4.2" print width, Serial and Parallel interfaces, 2MB DRAM, 4MB flash. Includes US power supply and product reference guide. Order cables separately. Direct thermal, 203 dpi, 2.4" print width, Serial interface, 2MB DRAM, 4MB flash. Includes US power supply and product reference guide. Order cables separately. Thermal transfer, 203 dpi, 2" print width, Parallel, 2MB DRAM, 4MB Flash, Includes US power supply. Direct thermal, 203 dpi, 4.2" print width, Serial and Parallel interfaces, 2MB DRAM, 4MB flash, Peeler. Includes US power supply, and product reference guide. Order cables separately. Direct thermal, 203 dpi, 4.2" print width, Serial, Parallel, and Ethernet interfaces, 2MB DRAM, 4MB flash. Includes 100-240V power supply (power cord not included) and product reference guide. Order cables separately. Direct thermal, 203 dpi, 2.4" print width, Serial and Ethernet interfaces, 2MB DRAM, 4MB flash. Includes US power supply and product reference guide. Order cables separately. Thermal transfer, 203 dpi, 4.2" print width, Serial and Parallel interfaces, 2MB DRAM, 4MB flash, Peeler. Includes US power supply, and product reference guide. Order cables separately. Thermal transfer, 203 dpi, 4.2" print width, Serial and Parallel interfaces, 2MB DRAM, 4MB flash. Includes 230V International power supply and product reference guide. Order cables separately. 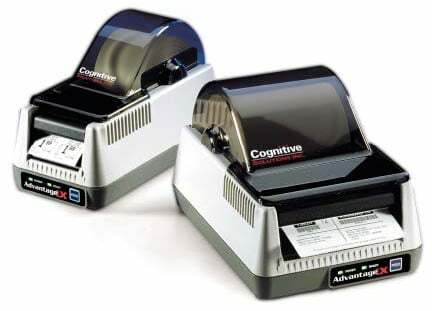 Cognitive has a long standing series of reliable desktop label printers which the Advantage LX is the most current generation of. These compact and easy to use printers are perfect for printing shipping labels, retail tags, and any other general purpose labels. Even though they are small, with an all metal chassis they can handle mission critical applications without worry. Many businesses are still using Cognitive printers that are 5-10 years old! Competing desktop printers may have a few more labels size options but for a printer that will last without a heavy price tag, the Cognitive Advantage LX is a top choice. Label maker was brand new, great price and works great. Easy installation. Interfaced with our old DOS program without a glitch. Our second Cognitive barcode printer and the new one plugged in and ran like a charm. No muss, no fuss.